Have you noticed some trendy terms linking the worlds of healthcare and food of late? Terms like ”veggie prescriptions” ”culinary medicine” and ”teaching kitchens”? Well the connection between nutrition and health is more than a trend. The phenomenon is growing rapidly as clinicians recognize the important role of food in supporting health and well-being. Two members of our Chapter have been pioneers of this work. 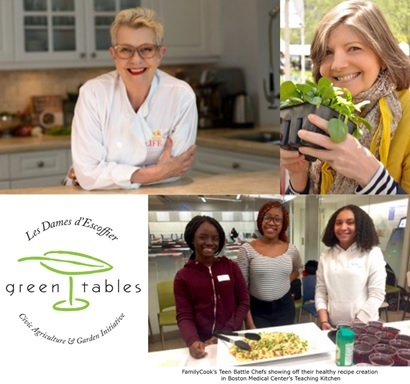 Join FamilyCook Productions founder and author Dame Lynn Fredericks, along with Dame Ann Ogden Gaffney, founder of Cook for Your Life, for a deep dive into the many ways that the culinary arts are blending with healthcare. Lynn’s secrets from FamilyCook’s award-winning teaching kitchen programs utilized by such clients as Boston Medical Center to treat patients with chronic diseases. Hands-on opportunity to co-create examples of FamilyCook’s most in-demand and delectable recipes. Insight from Dame Ann Ogden Gaffney’s innovative NIH supported Cook for Your Life website and healthy cooking programming, designed to teach cancer patients healthy eating habits through basic cooking skills. Operators of a third style of teaching kitchen - Columbia Presbyterian's program for medical students - present an overviw of how they prepare meals for clientele of all ages to support healthy outcomes. Operators of a third style of teaching kitchen—Columbia Presbyterian’s program for medical students—present an overview of how they prepare meals for clientele of all ages to support healthy outcomes. Q&A session—moderated by culinary nutritionist, Dame Stefanie Sacks, so you can ask the experts while enjoying the delicious and healthy fruits of shared labor. Raffle tickets available—$5 for one; three for $10—for chance to win OXO Kitchen Prep Kit (2 sets): 3 Blade Hand-Held Spiralizer * Herb and Kale Stripping Comb * V-Blade Mandoline Slicer * 3 Piece All Purpose Dispenser Set * 3 Piece Reusable Lid Set * Greensaver Produce Keeper * Complete Grate & Slice Set * 2 Piece Cutting Board Set * 3 Piece Prep Peeler Set with Assorted Blades. $200 Value. Wines courtesy of Dame Rachel Martin. Many thanks to Oxo for raffle prizes.